Background: There are limited treatment options available for patients with advanced pancreatic ductal adenocarcinoma (PDAC). We conducted a phase II study evaluating the efficacy and safety of capecitabine/oxaliplatin (CAPOX) in patients with locally advanced and metastatic PDAC treated in the first and second lines. Methods: Forty subjects with advanced PDAC and ECOG performance status ≥2 were enrolled. Treatment consisted of capecitabine 2,000 mg/m2 orally in two divided doses daily for 14 days and oxaliplatin 130 mg/m2 intravenously day 1 every 21 days. The primary endpoint was response rate (RR); secondary endpoints included safety analysis, progression free survival (PFS) and overall survival (OS). Results: The overall RR was 12.5% (N=3); the disease control rate was 67% (N=16). Due to the protocol definition for eligibility of response evaluation, only 60% (N=24) were evaluable for the primary endpoint. Median progression free survival (mPFS) was 3.8 months (95% CI: 1.3, 6.2); median OS (mOS) was 7.4 months (95% CI: 4.8, 12.2). The most common grade 3/4 toxicities included: fatigue (19%), nausea (17%), and diarrhea (14%). Conclusions: CAPOX is an active regimen in patients with advanced PDAC and is associated with acceptable toxicity. Careful consideration should be given to response endpoints and outcome measures when studying this characteristically ill population. Submitted Feb 18, 2017. Accepted for publication Apr 26, 2017. Despite recent advances in systemic therapy for advanced pancreatic ductal adenocarcinoma (PDAC), outcomes remain limited by poor survival and, for the most aggressive regimens, significant toxicities. Until 2011 when the FOLFIRINOX regimen [intravenous fluorouracil (5FU), leucovorin, oxaliplatin, and irinotecan] demonstrated superior overall survival (OS) compared to intravenous gemcitabine alone, single agent gemcitabine was the standard of care for first line treatment (1,2). Subsequently in 2013, the combination nab-paclitaxel/gemcitabine also demonstrated better OS than gemcitabine alone (3) in the first line setting. In addition, intravenous 5FU/leucovorin and nanoliposomal irinotecan in the second-line setting after gemcitabine-based chemotherapy has recently been shown to improve survival compared to intravenous 5FU/leucovorin alone or nanoliposomal irinotecan alone (4). Due to substantial toxicities, however, many PDAC patients are not able to tolerate these regimens. In particular, questions have been raised about how much toxicity (and benefit) irinotecan contributes to the 5FU-oxaliplatin backbone in FOLFIRINOX. In addition, the continuous infusion 5FU in FOLFIRINOX may add logistical and quality of life concerns for patients. In rectal cancer, oral 5FU (capecitabine) is non-inferior compared to continuous infusion 5FU (5) and may be more convenient for patients. 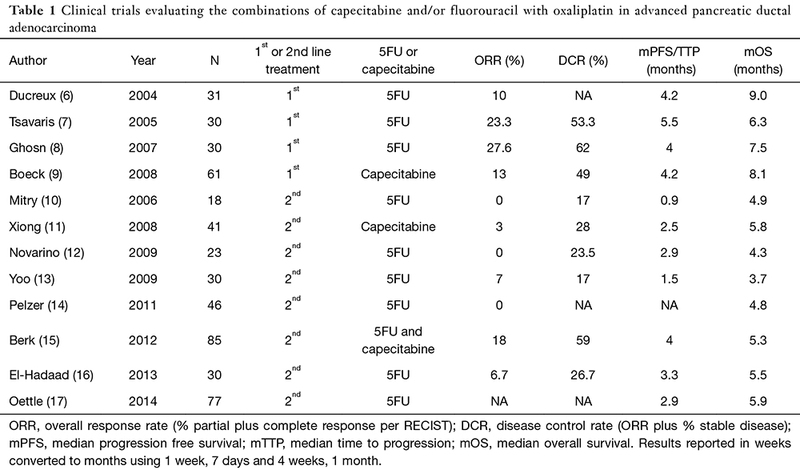 The activity of infusional 5FU combined with oxaliplatin without the addition of irinotecan for advanced PDAC has been reported in several small studies (Table 1). Intravenous 5FU and oxaliplatin appear active in first line (FOLFOX, OFF, OXFU) and second-line (weekly oxaliplatin/5FU/leucovorin, FOLFOX) regimens (6-8,10,12-14,16,17). Median OS and response rates (RRs) were superior in the first line compared to second line studies. The combination capecitabine and oxaliplatin showed similar efficacy and toxicity profile to FOLFOX4 in a study evaluating both XELOX and FOLFOX4 in the second line (XELOX PR 18%, SD 41%, mOS 21 weeks; FOLFOX PR 17%, SD 26%, mOS 25 weeks) (15). Two additional small studies have evaluated capecitabine combined with oxaliplatin in advanced PDAC (Table 1) (16,17). The first by Xiong and colleagues was a non-randomized phase II study evaluating capecitabine and oxaliplatin (CAPOX) in subjects who had progressed on gemcitabine (n=41) (16). Results were not as encouraging as those seen in studies of oxaliplatin combined with intravenous 5FU or gemcitabine (mOS =5.75 months; PR in 1 subject; SD in 10 of 39 (26%) evaluable subjects). The side effects were manageable, however, and the study population appeared more ill than in other studies: 95% had metastatic disease and almost 30% had an Eastern Cooperative Oncology Group (ECOG) Performance Score (PS) of 2. In the same year Boeck and colleagues published a randomized three-arm phase II trial evaluating CAPOX, combination capecitabine/gemcitabine, and combination gemcitabine/oxaliplatin (17). Results for the CAPOX arm showed median progression-free survival (mPFS) 4.2 months, mOS 8.1 months, and fewer grade 3 and 4 hematologic toxicities than in the gemcitabine containing arms. The authors concluded that each regimen demonstrated similar clinical efficacy and safety profiles in this population. Given the scarcity of treatment options at the time of study initiation in the mid-2000s, we undertook a Phase II trial to assess CAPOX for first and second-line treatment in advanced PDAC. We present here the results of a multi-institutional Phase II single-arm trial that evaluated 40 patients treated with CAPOX for first or second-line treatment of locally advanced or metastatic PDAC. Forty subjects with locally advanced or metastatic PDAC were enrolled at three academic institutions for first or second line treatment (Figure 1). All subjects had histologically or cytologically confirmed PDAC and had received at most one prior chemotherapy regimen for advanced disease. Previous adjuvant chemotherapy was permitted if completed more than 12 months prior to initiation of study treatment. Other eligibility criteria included ECOG PS ≤2, adequate organ function and life expectancy ≥3 months (additional details in Supplementary 1). The Institutional Review Board approved this study, and all subjects provided written informed consent. Participants self-administered capecitabine 1,000 mg/m2 orally twice daily (total daily dose 2,000 mg/m2), days 1–14 in 21-day cycles. Only 500 mg tablets were used, and doses were rounded to the nearest dose that could be administered with 500 mg tablets. Oxaliplatin 130 mg/m2 was administered intravenously on day 1 every 21±2 days. Treatment continued until tumor progression or toxicity requiring discontinuation of therapy. Oxaliplatin was provided by Sanofi-Synthelabo as investigational drug supply and capecitabine was prescribed commercially. Response was assessed by computed tomography (CT) or magnetic resonance imaging (MRI) every two cycles (42±2 days) using RECIST criteria (18). Complete responses (CR) and PR were confirmed by repeat scan one month later. Chemotherapy doses were modified for toxicities as outlined in the protocol (Supplementary 2). Capecitabine was held for any grade 2, 3, or 4 toxicity, and the dose was reduced when restarted after toxicity resolution. The oxaliplatin was dose-reduced for hematologic and neurologic toxicities, and the infusion was extended to six hours if a subject experienced acute laryngopharyngeal dysesthesia. Compliance with oral capecitabine was documented at each study visit by pill count. 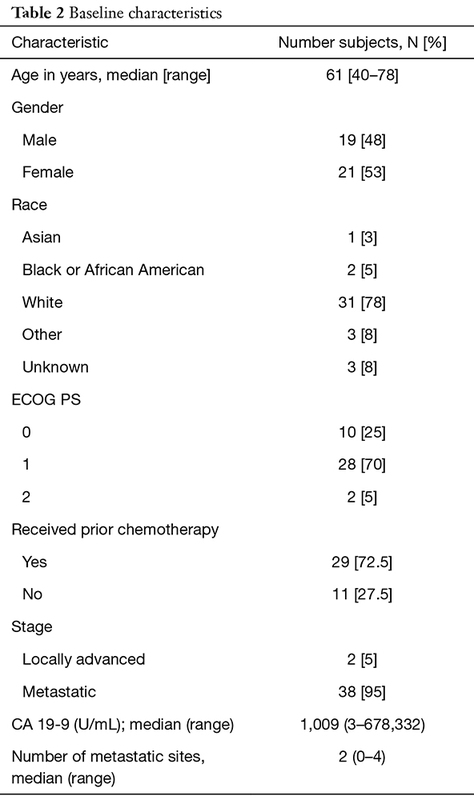 The primary endpoint was RR, defined as objective response of measurable disease per RECIST criteria (18). Subjects were evaluable for response if two cycles of treatment on study were completed. An interim analysis was conducted after the first 12 subjects according to the Simon’s 2-stage design (19). Anticipating that 10% of subjects would not be evaluable for response, a total of 40 patients were enrolled to achieve 90% power to detect 20% difference in response in target lesions, with type 1 error of 10% and alpha <5%. A two-sided 80% CI was estimated considering the two-stage design based on Atkinson and Brown methods (20). Demographics, disease characteristics and adverse events are presented for the safety population. Progression free survival (PFS) reflects time from enrollment until progression or death. Subjects who did not reach progression or were lost to follow-up were censored at the date of last progression free disease evaluation. Disease control rate included data on subjects with CR, PR, and SD. PFS and OS were calculated by the Kaplan Meier method. Subjects were included in the PFS analysis if they completed two cycles on treatment (response evaluable population); subjects were included in the OS and safety analyses if they took any capecitabine or oxaliplatin dose on study. We also performed a post-hoc literature review to search for all advanced pancreatic cancer studies evaluating capecitabine and oxaliplatin, and infusional 5FU and oxaliplatin. Search terms included: advanced or metastatic pancreatic cancer, 5FU, oxaliplatin, capecitabine, clinical trial. The following data was abstracted: First author, year of publication, number of subjects, line of treatment, and when available, ORR, DCR, mPFS and mOS. Forty subjects were enrolled between May 2004 and March 2010. Baseline demographics and disease characteristics are presented in Table 2. The majority of participants (95%) had an ECOG PS 0–1, had metastatic PDAC (95%), and had previously received gemcitabine for advanced PDAC (72.5%). Thirty-seven subjects received at least one dose of capecitabine and/or oxaliplatin on study (safety population). The reasons for not receiving any treatment on protocol were: ineligibility due to poor performance status and withdrawal of consent. The median number of cycles per subject was 2 (range, 1–12). Among subjects evaluable for response (n=24), the most common reasons for discontinuation were disease progression (n=17; 71%), followed by toxicity (n=4; 17%), and subject and/or physician preference (n=3; 13%). 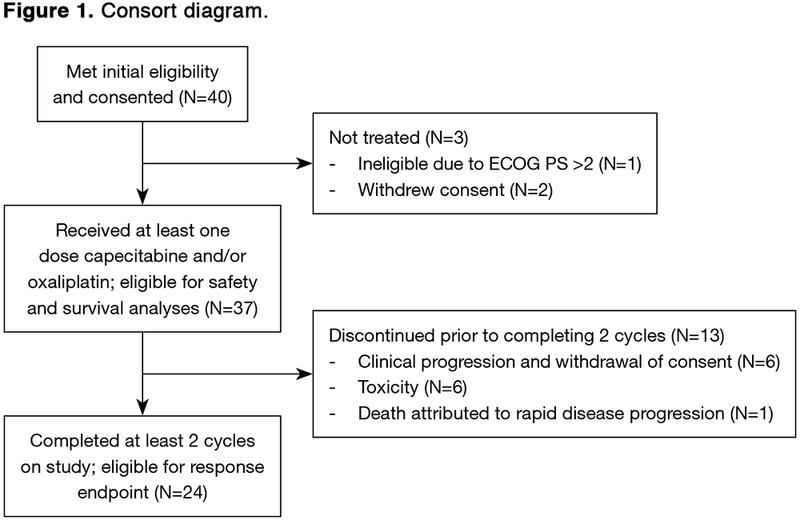 Subjects not evaluable for response withdrew prior to completing two cycles due to withdrawal of consent and/or clinical progression (n=6; 46.2%), toxicity (n=6; 46.2%), and death attributed to rapid disease progression (n=1; 7.7%). Dose reductions were performed for toxicity in nine (25%) subjects and treatment holds in 16 (44%) subjects. There were 36 subjected included in the toxicity analysis as one patient was missing adverse event data. The most prevalent toxicities are reported in Table 3. Two subjects died during treatment, one due to a cerebrovascular ischemic event and one due to colitis.